As a player, you will play through the critical epoch during which this change occurred. After millions of years of an uninterrupted, modest nomadic existence, we suddenly developed complex language, began forming tribes and building villages. You play as one of the human species existing at that time. The game system enables you to follow your tribe's evolution as well as that of the environment in which you live. In Ice Age Europe, you are either the Archaic, Neanderthal, or Cro-Magnon species. Assign your males to hunt megafauna while avoiding predators. Specialize your elders for fire, inventions, war, or animal husbandry. Choose your mating strategy - promiscuous, harems, or pair bonding. Intermarriage leads to increased vocabulary and cognitive fluidity. Compared with the 1st edition, this edition contains custom meeples for each tribe, upgraded art, new play aids. Contains 60 cards, 3 elder boards, 54 meeples, 3 large meeples, 45 disks for social, nature, & technical vocabulary, 10 dice. 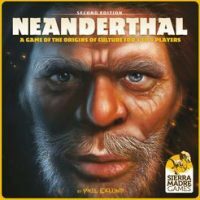 Add a Review for "Neanderthal (2nd Ed)"